The luxury Thomastown establishment is in bullish form this year, thanks to new investment from its owners and key appointments to its management team. Andrew Jennings reports. In late December 2015, in the same week that most of the country was signing off for Christmas, the Irish Hotels Federation (IHF) issued its latest health report for the industry heading into the new year. The IHF’s end-of-year Hotel Barometer claimed that the vast majority of Irish hotels were upbeat going into 2016, with 92 per cent citing a positive outlook for the 12 months ahead. The report mentioned that a similar number (90 per cent) reported an upturn in business levels in 2015, following a 13-per-cent increase in overseas visitors. “The hotels sector is benefiting from increased tourism from all key markets, including North America (up 13 per cent), Britain (up 11 per cent) and the rest of Europe (up 14 per cent),” said the IHF, with domestic tourism and hospitality business also performing well following “years of subdued consumer confidence”. Stephen McNally, the now former president of the IHF, affirmed that confidence among hoteliers is being supported by “highly effective marketing campaigns targeting key overseas markets and a number of pro-tourism initiatives, such as the 9-per-cent VAT rate”. Despite this reported return to something near rude health for the hotel sector – lest we forget – it has been only a few short years since the picture was manifestly less rosy. “It’s a game of last-man-standing,” said McNally’s predecessor, Paul Gallagher, in 2010 – the height of the recession – warning of “an enormous problem” in the sector. The problem included a slump in Irish hotel occupancy to about 54 per cent in 2009, the lowest level since the early 1980s, while the numbers of trips to Ireland fell 20 per cent in the two years through to mid- 2010. At least 200 hotels opened during Ireland’s economic boom, leaving a glut of empty rooms and mountain of debt as the number of visitors dwindled. While some establishments cut their losses and shut, others lowered prices to stay in business. For the five-star Mount Juliet hotel and golf resort in Co. Kilkenny, it was more like falling into a long period of hibernation – a case of pulling over the covers and waiting for the worst to pass. Capital Gains Irish property investment firm Tetrarch Capital bought Mount Juliet (which includes a luxury hotel and a Jack Nicklaus-designed golf course on 500 acres) from the Killeen Group, owned by the Mahony family, for approximately €15 million in mid-2014. Tetrarch (formerly Brehon Capital) late last year announced plans to invest €100 million in the Irish hospitality, leisure and accommodation market over the next three years. Mount Juliet, alongside Tetrarch’s other eminent hotels – Powerscourt, Citywest, and The Marker in Dublin – looks set to benefit from this multimillion-euro investment. 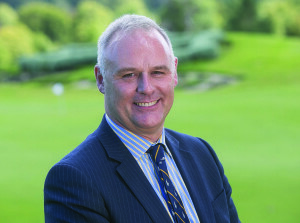 “We are trying to get the message out there that Mount Juliet is very much open for business,” Peter Wilson (pictured below), general manager, tells Hospitality Ireland, adding that 2015 saw a noticeable upturn in business. “The owners, Tetrarch, have been here for a while now, and since they took over, there has been a significant amount of investment in the overall property. “Last year was a good one. The golf business started to come back, and our accommodation figures were strong. Like many hotels, the end of October and most of November weren’t great, but we had a full house here over Christmas,” adds Wilson, who was appointed general manager last year, having held a similar post at the former Whites of Wexford (now Clayton Whites). According to the IHF, the improved outlook for the tourism and hospitality sector means that hotel owners are now in a stronger position to invest in their business, with the IHF’s Barometer results in December showing that 92 per cent of hoteliers are planning to invest in refurbishment and product development over the next 12 months, while 62 per cent are planning to increase their investment in marketing. Speaking to The Irish Times in June last year, Michael McElligott, Tetrarch’s chief executive, said that the firm’s investment is part of his company’s long-term strategy to revitalise Mount Juliet. “We view our investment as a generational one, and we have very clear long-term ambitions for Mount Juliet,” McElligott said. “With a spend of over €10 million planned over the next 12-18 months, our clear goal is to maintain and enhance the property as the most wonderful, welcoming and highest-quality golf resort and residential community in Ireland,” he added. The newspaper reported that a note was sent to homeowners living on the Mount Juliet estate last year to update them on a meeting between the owners, the new membersof the resort’s management team, and a committee representing the golf club there. The letter reportedly stated that the golf course was a ‘significant loss-maker’ in 2014, and that this situation had continued into 2015. It stated that ‘maintenance costs remain extraordinarily high compared to the country’s other leading parkland courses in Ireland and other comparable courses in the UK and Europe’. In response, Tetrarch’s investment since has included around €1 million in new equipment to improve the golf course and to help it return to profitability, while it also decided to increase fees, rebrand the resort and upgrade the golf club and shop, bar and catering facilities. “At the moment, most of our golf business comes from the Irish home-holiday market,” reveals Wilson. “We are starting to see some international business coming back to play golf, which is obviously important for us as a golf destination. During the recession, there was a lack of investment in most golf resorts around the country, but we’ve invested €750,000 just in basic equipment, and I think it is slowly starting to pay off. Upgrading the golf facilities is just part of the larger investment picture for Tetrarch at Mount Juliet. Following the June bank holiday this year, refurbishment work is set to begin on the Hunter’s Yard building. This forms part of the company’s plan to increase the number of bedrooms on site by 76 and to grow the scale of its hospitality facilities. Mount Juliet’s Manor House, which boasts 31 rooms and the Michelin-starred Lady Helen restaurant, closed for two weeks in January for a complete refurbishment of its ground floor. “I suppose we’re in a bit of a quandary at the moment because there’s a lot of redevelopment happening,” says Wilson about how the hotel will be marketed in 2016. “In June, we’re adding on 76 bedrooms, so part of hotel will close as we expand significantly. So, for 2017, we’ll have two separate properties [the Manor House and the expanded Hunter’s Yard]. “The Manor House is aimed toward the upper end of the US market, and we enjoyed a very good 2015. The extension at Hunter’s Yard will open up new markets, people that haven’t visited Mount Juliet before. It will increase our capacity for weddings and conferences, and it will make staying at Mount Juliet that little bit more affordable, particularly when it comes to the golf market,” Wilson adds. Food and beverage remains the highest revenue-earner for Mount Juliet, followed by accommodation and golf, respectively. Wilson acknowledges that it was important that the Lady Helen restaurant, which, on average, does around 40 to 45 covers on a standard night, retained its Michelin star last year. “I think people perhaps have the perception that the [Lady Helen] restaurant isn’t open to the public, but it most definitely is,” he says. “We do a lot of outside business, but we’re looking to do more. It’s probably due to a lack of publicity or advertising of the restaurant over the past few years. We’ve had some key changes to management at Mount Juliet over the last 12 months, so it’s testament to the staff here, who have been through the big transition, that they’ve been able to maintain such incredible standards. It was a phenomenal achievement to retain the star,” adds Wilson. The Lady Helen retaining its star alongside fellow Kilkenny eatery Campagne provided a welcome shot in the arm for the dining scene in the county and region. “We are very lucky down here,” says Wilson. Among the challenges for the industry highlighted by the IHF in its report includes the high cost of doing business in Ireland, which is stifling competitiveness with hoteliers facing excessive local-authority rates, increasing labour costs, and high utility costs. “Yes, running costs, wage costs and utilities are always an ongoing issue,” admits Wilson. “Because there’s been an improvement in the overall economy, we will be under pressure for wage increases. People will expect to see increases. Trying to manage costs over the next couple of years will be a challenge for us, while the new construction refurbishment work will also bring its own challenges.” Wilson is predicting that the five-star hotel market in Ireland is likely to contract somewhat in 2016. “There could be an advantage for us if the five-star market is contracting a little bit, with the likes of Adare closing for a refurb, and quite a lot of the other ones going through refurb transactions at the moment, which might end up helping our business. The weakness in the euro is also helping big time. We’re starting to see a lot more enquiries from the US and the UK,” he says. Wilson, who has also worked at Lyrath Estate Hotel and Knockranny House Hotel, believes that the perception of the hotel industry in Ireland has changed a great deal during his time working in it. “Ten years ago, it was seen as a poor business to work in, with poor working conditions,” he says. “I do think there’s been a huge amount of effort to change that whole perception of the business. “I think one of the things to come out of doing business through the recession is that we’ve become better business people and are able to manage our businesses better. “Yes, we’ve all been through some horrific times, with some coming through it, but, unfortunately, many have not. I think we can now recognise that we were all overstaffed, so I think now the industry is a lot more efficient regarding staff levels. “We also need to deliver better value now,and I think that’s going to continue. I think people will pay, but only if they’re getting value for money – and that goes for one-, three- or five-star properties – so it’s about trying to get that balance. It’s now about trying to find that balance between being economical while, at same time, offering value for money. And with Tetrarch’s backing and its ambitious plans for Mount Juliet, business is looking good.